Slide on Terminals! No Soldering! Easy Installation! Diagram Included!. 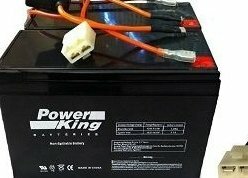 High Performance (2) 12V 7ah SLA Batteries. Fully Charged Ready to Ride!. 1 Year Warranty!.